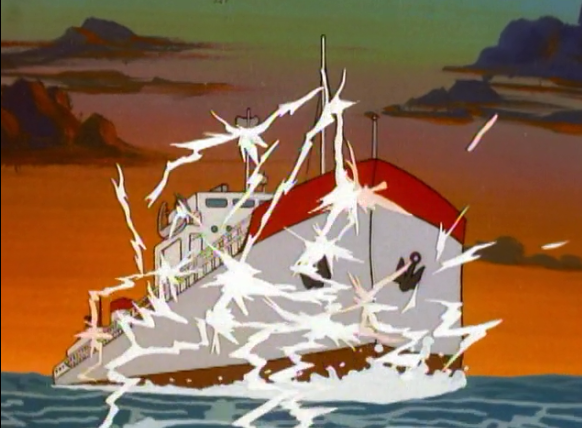 John Kenneth Muir's Reflections on Cult Movies and Classic TV: Saturday Morning Cult-TV Blogging: Godzilla (1978): "The Megavolt Monster"
Saturday Morning Cult-TV Blogging: Godzilla (1978): "The Megavolt Monster"
In “The Megavolt Monster,” an oil tanker traverses a remote ocean trench, only to be struck and downed by a storm of electrical charges. The Calico heads to investigate, and Quinn wonders if the electrical charges could be caused by a new power source beneath the sea itself. If so, she wonders if it could be the breakthrough the world needs in a time of crisis. She also reports legends that claim the trench is bottomless, and populated by monsters. Quinn and Brock take a bathysphere to the bottom of the trench, and find a world there beneath the sea, a “freak of nature” or giant “air bubble.” They also find there three giant monsters that are the equivalent of “gigantic electric eels.” The monsters appear to feed off of a strange rock that constantly energizes them. 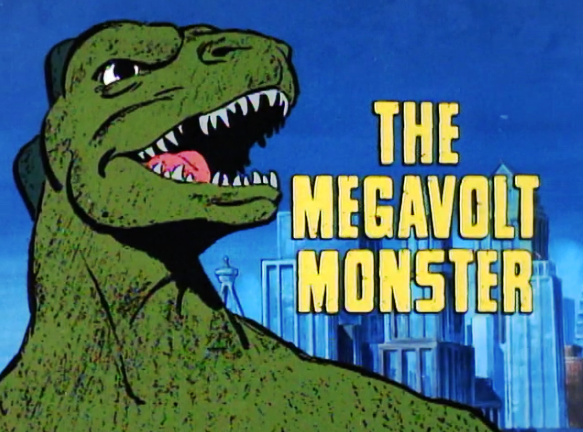 The Calico crew summons Godzilla, and the giant lizard arrives to fight the beasts, and destroy their power source so they can’t recharge. 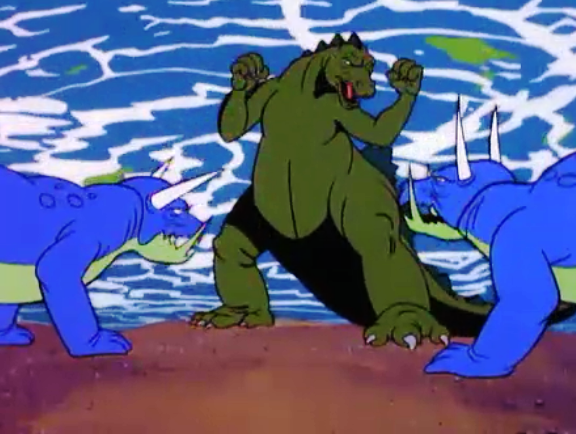 I really enjoyed this episode of the 1978 Godzilla cartoon, perhaps because it reminded me so much of all my favorite stories as a kid. First, of course, there’s Godzilla himself, fighting a trio of giant, electric-eel type monsters. But secondly, there’s the discovery by the Calico crew of a kind of “lost world” beneath the sea, and I have always enjoyed stories of this type: the modern world interfacing with places forgotten by time. I've always found such "lost worlds" fascinating, and when I was a kid, I loved movies about them; movies like Island at the Top of the World (1974), for instance. Although it is frustrating that the comic-relief, Godzooky, continues to get more screen time than Godzilla does in this series, some of the character touches in the episode are actually quite good. For instance, I really liked the overall depiction of Quinn (Brenda Thompson) here. She is in control of the Calico and its mission. She is the boss, and yet not bossy at all. She is a strong, authoritative figure who shapes the dynamics of the ship’s quest, and makes decisions about to proceed. There is not a whiff of “damsel in distress” about her, nor one of stereotypical “over-controlling, professional woman.” Sadly, Hollywood vacillates between those two extremes and has a really tough time presenting a woman authority figure without making her either weak and helpless or so authoritative that she comes across as a jerk. Quinn - an artifact of the 1970s – is a great role model, and a three dimensional character. The thing to remember about this iteration of Godzilla, I suppose, is that it is designed for children, and for children of 1978. 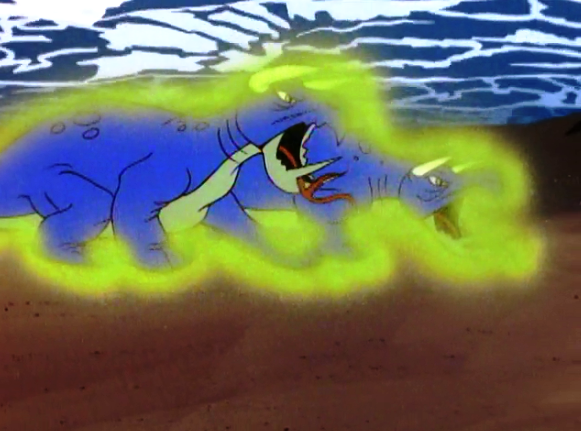 Godzooky always gets into trouble, and at my age now, I find him more annoying than funny. My seven year old son? He thinks Godzooky is a hoot. Therefore, I resolve not to complain about his presence. At least not too much. 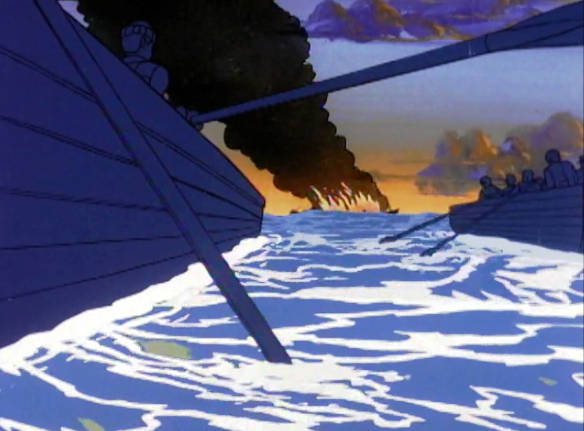 Finally, I like some of the art in this episode, particularly the visuals of the oil tanker going down, and the crew escaping in life-boats. It's a bit expressionistic and "dark," and sets up well the mystery of the episode. Next week: "The Seaweed Monster."